A stylish way to keep your essentials close at hand, the Leather Hip Pouch slides onto your belt and sits over the hip. This medieval leather pouch is handcrafted from high quality leather in a variety of colors to match your look. The hexagon pouch is laced to a wide backing panel, which curved for a sleek look and fit. A swivel clasp on the front flap keeps your items secure and comes in your choice of steel, brass, or antique brass. Two slots on each end of the back panel make it easy to wear this leather belt bag on belts up to 1.5 inches wide, and it can be worn on either hip. Please note that the lacing is black for all leather color options except for Brown, on which the lacing will be brown to match the leather. 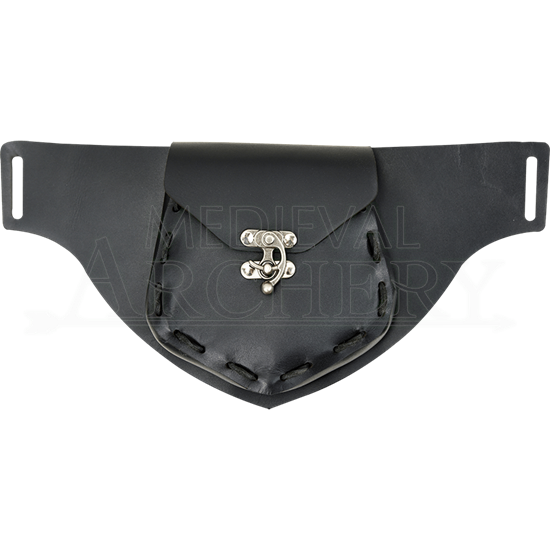 Whether accessorizing an outfit for the Renaissance fair, a LARP event, or any other costuming occasion, the Leather Hip Pouch provides unique means for carrying things while keeping your hands free. Black and Brown options are made of 5/6 ounce chrome tanned leather. Red, Green, Royal Blue, Navy Blue, and Purple options are made of 3/4 ounce vegetable tanned leather.